The Vanguard Quovio 44 Photo-Video Backpack's extra-large Quick Side Access puts your full-size professional DSLR at your fingertips in a split second with one zip so you'll never miss the action. 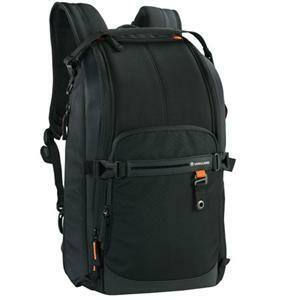 Inside this sleek backpack a roomy interior offers plenty of room for a DSLR with attached zoom lens additional zoom and other lenses flash and other accessories. A convenient tripod holder with Quick Adjustment Straps makes bringing your tripod along quicker and simpler than ever. Quovio 44 easily converts from a backpack to a day pack with separate compartment by simply rearranging its customizable interior dividers. Or use either set up as a fast-acting sling bag by simply detaching and stowing one of its two shoulder straps in the built-in pouch. It's like having three bags in one.